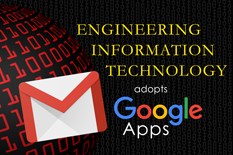 Engineering Information Technology is now using Google Apps for Education. As early adopters of Google Apps, EIT staff will have time to master the intricacies of the suite of applications in preparation for supporting the Clark School of Engineering. Some of the Google Apps include: Gmail, Calendar, Drive, Docs, Sheets, Slides, and Hangouts. Google Apps will permit users to utilize new ways to collaborate, access information, and stay connected. Faculty and staff will be able to access their email and calendar securely from any authorized computer or smartphone, anyplace and any time. Additionally, it will enable the University of Maryland community to stay on course and keep pace with the steady march of progress and innovation. The move from Exchange to Google will occur later in the year for other schools and units. The Clark School is scheduled for a July 11th migration. For more information see the UMD-Google Apps page.